Marianne Brandt (1 October 1893 – 18 June 1983) was a painter, sculptor, photographer and designer who studied at the Bauhaus school and became head of the metal workshop in 1928. 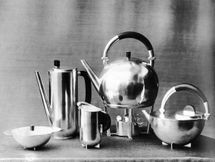 Brandt's designs for metal ashtrays, tea and coffee services, lamps and other household objects are now recognized as among the best of the Weimar and Dessau Bauhaus. Further, they were among the few Bauhaus designs to be mass-produced during the interwar period, and several of them are currently available as reproductions. Beginning in 1926, Brandt also produced a body of photomontage work, though all but a few were not publicly known until the 1970s after she had abandoned the Bauhaus style and was living in Communist East Germany. The photomontages came to public attention after Bauhaus historian Eckhard Neumann solicited the early experiments, stimulated by resurgent interest in modernist experiment in the West. These photomontages often focus on the complex situation of women in the interwar period, a time when they enjoyed new freedoms in work, fashion and sexuality, yet frequently experienced traditional prejudices. 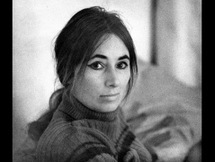 Brandt is also remembered as a pioneering photographer. She created experimental still-life compositions, but it is her series of self-portraits which are particularly striking. These often represent her as a strong and independent New Woman of the Bauhaus; other examples show her face and body distorted across the curved and mirrored surfaces of metal balls, creating a blended image of herself and her primary medium at the Bauhaus. Brandt was one of few women at Bauhaus who distanced herself from the fields considered more feminine at the time such as weaving or pottery. During the 1930s and 1940s, Brandt lived in near isolation, despite having many opportunities available to her after her time at Bauhaus. She had just finished showing five photographs at an exhibition put on by Werkbund. The section her work was shown in was curated by her old boss Moholy-Nagy. 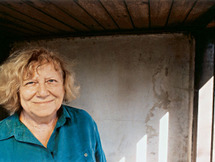 After travelling from job to job and project to project, Brandt lived in her hometown of Chemnitz for sixteen years and did not have any official position. She still produced work, but it was not for a specific purpose or commission. She began to paint, in both watercolour and tempera. These materials were cheaper and the pieces could be completed more quickly. The paintings are sometimes melancholy and depressing, but this is not surprising considering their timing during her unemployment and the Nazi period.